This massages the diagnostics (e.g. handling things like "report warnings as errors" and passes them off to the DiagnosticConsumer for reporting to the user. 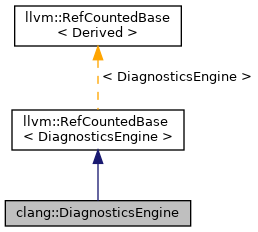 DiagnosticsEngine is tied to one translation unit and one SourceManager. Definition at line 148 of file Diagnostic.h. Represents on argument value, which is a union discriminated by ArgumentKind, with a value. Definition at line 206 of file Diagnostic.h. Definition at line 501 of file Diagnostic.h. Definition at line 160 of file Diagnostic.h. Definition at line 151 of file Diagnostic.h. Definition at line 74 of file Diagnostic.cpp. References DummyArgToStringFn(), Reset(), and setClient(). Definition at line 85 of file Diagnostic.cpp. Clear out the current diagnostic. Definition at line 882 of file Diagnostic.h. Referenced by EmitCurrentDiagnostic(), clang::Sema::EmitCurrentDiagnostic(), and clang::PartialDiagnostic::EmitToString(). Converts a diagnostic argument (as an intptr_t) into the string that represents it. Definition at line 784 of file Diagnostic.h. Definition at line 698 of file Diagnostic.h. Definition at line 91 of file Diagnostic.cpp. Definition at line 95 of file Diagnostic.cpp. Emit the current diagnostic and clear the diagnostic state. Force Emit the diagnostic regardless of suppression settings. Definition at line 498 of file Diagnostic.cpp. References Clear(), getClient(), clang::Diagnostic::getID(), clang::Diagnostic::getLocation(), clang::DiagnosticIDs::Ignored, and clang::DiagnosticConsumer::~DiagnosticConsumer(). Definition at line 509 of file Diagnostic.h. Referenced by clang::arcmt::CheckAction::BeginInvocation(), clang::arcmt::ModifyAction::BeginInvocation(), clang::arcmt::MigrateAction::BeginInvocation(), EmitCurrentDiagnostic(), clang::ASTUnit::enableSourceFileDiagnostics(), clang::ASTMergeAction::ExecuteAction(), clang::FixItRewriter::FixItRewriter(), clang::DiagnosticIDs::getNearestOption(), SetupSerializedDiagnostics(), clang::VerifyDiagnosticConsumer::UpdateParsedFileStatus(), and clang::ASTUnit::~ASTUnit(). Definition at line 510 of file Diagnostic.h. Retrieve the maximum number of constexpr evaluation notes to emit along with a given diagnostic. Definition at line 580 of file Diagnostic.h. Definition at line 990 of file Diagnostic.h. Definition at line 992 of file Diagnostic.h. Definition at line 777 of file Diagnostic.h. Referenced by clang::CodeGen::createOffloadEntriesAndInfoMetadata(), emitAArch64DeclareSimdFunction(), clang::CodeGen::CodeGenModule::Error(), clang::CodeGen::CodeGenModule::ErrorUnsupported(), clang::TextDiagnosticBuffer::FlushDiagnostics(), hasSuperInitCall(), IsHeaderFile(), isParenthesizedADLCallee(), isTypeSubstitutable(), clang::CodeGen::loadOffloadInfoMetadata(), mangleAArch64VectorBase(), clang::arcmt::FileRemapper::remap(), reportDiag(), rewriteToNumericBoxedExpression(), runThinLTOBackend(), and clang::TemplateDeclInstantiator::VisitVarTemplateSpecializationDecl(). Definition at line 494 of file Diagnostic.h. Referenced by checkDiagnosticGroupMappings(), clang::ASTMergeAction::ExecuteAction(), clang::html::HighlightMacros(), isTargetEnvironment(), clang::ProcessWarningOptions(), and clang::PCHValidator::ReadDiagnosticOptions(). Based on the way the client configured the DiagnosticsEngine object, classify the specified diagnostic ID into a Level, consumable by the DiagnosticConsumer. To preserve invariant assumptions, this function should not be used to influence parse or semantic analysis actions. Instead consider using isIgnored(). Loc The source location we are interested in finding out the diagnostic state. Can be null in order to query the latest state. Definition at line 835 of file Diagnostic.h. Referenced by checkDiagnosticGroupMappings(), clang::driver::Driver::ParseArgStrings(), and clang::Sema::DeviceDiagBuilder::~DeviceDiagBuilder(). Get the current set of diagnostic mappings. Definition at line 504 of file Diagnostic.h. Definition at line 499 of file Diagnostic.h. Referenced by CheckResults(), clang::html::HighlightMacros(), RenderDiagnosticsOptions(), and clang::VerifyDiagnosticConsumer::UpdateParsedFileStatus(). Definition at line 642 of file Diagnostic.h. Definition at line 601 of file Diagnostic.h. Definition at line 615 of file Diagnostic.h. Definition at line 689 of file Diagnostic.h. Referenced by HasExtension(), and isExtHandlingFromDiagsError(). Definition at line 621 of file Diagnostic.h. Return the value associated with this diagnostic flag. Definition at line 885 of file Diagnostic.h. Definition at line 590 of file Diagnostic.h. Definition at line 762 of file Diagnostic.h. Definition at line 647 of file Diagnostic.h. Definition at line 652 of file Diagnostic.h. Referenced by clang::Decl::dump(), and clang::DeclContext::dumpLookups(). Definition at line 661 of file Diagnostic.h. Referenced by clang::TemplateSpecCandidateSet::NoteCandidates(), and noteOverloads(). Definition at line 521 of file Diagnostic.h. Referenced by clang::Diagnostic::getSourceManager(), and toLevel(). Definition at line 637 of file Diagnostic.h. Referenced by buildCounterUpdate(), and clang::Sema::tryExprAsCall(). Definition at line 627 of file Diagnostic.h. Referenced by checkDiagnosticMappings(), clang::Sema::diagnoseZeroToNullptrConversion(), getNullabilityCompletenessCheckFileID(), isConfigurationPattern(), and clang::sema::AnalysisBasedWarnings::IssueWarnings(). Retrieve the maximum number of template instantiation notes to emit along with a given diagnostic. Definition at line 568 of file Diagnostic.h. Definition at line 609 of file Diagnostic.h. Referenced by checkDiagnosticMappings(), and isExtHandlingFromDiagsError(). Definition at line 699 of file Diagnostic.h. Definition at line 748 of file Diagnostic.h. Referenced by clang::Sema::ActOnEndOfTranslationUnit(), compileAndLoadModule(), clang::CreateModernObjCRewriter(), clang::CreateObjCRewriter(), clang::ExecuteCompilerInvocation(), clang::PCHGenerator::HandleTranslationUnit(), clang::tooling::Transformer::run(), clang::FrontendAction::shouldEraseOutputFiles(), and Write_ProtocolExprReferencedMetadata(). Definition at line 755 of file Diagnostic.h. Definition at line 519 of file Diagnostic.h. Errors that actually prevent compilation, not those that are upgraded from a warning by -Werror. Definition at line 752 of file Diagnostic.h. Referenced by clang::PCHGenerator::HandleTranslationUnit(), clang::Sema::CodeSynthesisContext::isInstantiationRecord(), clang::sema::AnalysisBasedWarnings::IssueWarnings(), and clang::ASTUnit::serialize(). Determine whether any kind of unrecoverable error has occurred. Definition at line 758 of file Diagnostic.h. Counter bumped when an extension block is/ encountered. When non-zero, all extension diagnostics are entirely silenced, no matter how they are mapped. Definition at line 697 of file Diagnostic.h. Determine whethere there is already a diagnostic in flight. Definition at line 853 of file Diagnostic.h. This can be used to opportunistically avoid expensive checks when it's known for certain that the diagnostic has been suppressed at the specified location Loc. Definition at line 820 of file Diagnostic.h. Referenced by clang::Sema::ActOnEndOfTranslationUnit(), CheckCommaOperands(), CheckConditionalOperator(), CheckCXX98CompatAccessibleCopy(), CheckFallThrough(), checkNullabilityConsistency(), DiagnoseBadFunctionCast(), DiagnoseBaseOrMemInitializerOrder(), DiagnoseCallingConvCast(), DiagnoseForRangeVariableCopies(), DiagnoseMismatchedNewDelete(), clang::Sema::DiagnoseMultipleMethodInGlobalPool(), DiagnoseNullConversion(), clang::Sema::diagnoseZeroToNullptrConversion(), isEnabled(), clang::sema::AnalysisBasedWarnings::IssueWarnings(), clang::CompilerInstance::loadModule(), LookupMemberExpr(), LookupMethodInReceiverType(), maybeDiagnoseIDCharCompat(), ParseAlignPragma(), clang::Lexer::ReadToEndOfLine(), and shouldWarnIfShadowedDecl(). Determine whether the previous diagnostic was ignored. This can be used by clients that want to determine whether notes attached to a diagnostic will be suppressed. Definition at line 678 of file Diagnostic.h. Note that the prior diagnostic was emitted by some other DiagnosticsEngine, and we may be attaching a note to that diagnostic. Definition at line 800 of file Diagnostic.h. Referenced by clang::StructuralEquivalenceContext::Diag1(), clang::StructuralEquivalenceContext::Diag2(), clang::ASTImporter::FromDiag(), and clang::ASTImporter::ToDiag(). Determine whether this DiagnosticsEngine object own its client. Definition at line 513 of file Diagnostic.h. Referenced by SetUpDiagnosticLog(), SetupSerializedDiagnostics(), and clang::VerifyDiagnosticConsumer::~VerifyDiagnosticConsumer(). Pops the current DiagMappings off the top of the stack, causing the new top of the stack to be the active mappings. true if the pop happens, false if there is only one DiagMapping on the stack. Definition at line 109 of file Diagnostic.cpp. Copies the current DiagMappings and pushes the new copy onto the top of the stack. Definition at line 105 of file Diagnostic.cpp. This actually returns an instance of DiagnosticBuilder which emits the diagnostics (through ProcessDiag) when it is destroyed. DiagID A member of the diag::kind enum. Loc Represents the source location associated with the diagnostic, which can be an invalid location if no position information is available. Definition at line 1296 of file Diagnostic.h. Referenced by addSanitizersAtO0(), clang::AttachHeaderIncludeGen(), clang::FrontendAction::BeginSourceFile(), clang::TargetInfo::checkCFProtectionBranchSupported(), clang::TargetInfo::checkCFProtectionReturnSupported(), checkDiagnosticGroupMappings(), checkDiagnosticMappings(), clang::ento::CheckerRegistry::CheckerRegistry(), checkHeaderSearchOptions(), checkLanguageOptions(), clang::Preprocessor::checkModuleIsAvailable(), checkMSVCHeaderSearch(), checkPreprocessorOptions(), clang::CodeGen::CodeGenFunction::checkTargetFeatures(), checkTargetOptions(), checkVerifyPrefixes(), clang::CompilerInstance::clearOutputFiles(), collectModuleHeaderIncludes(), compileAndLoadModule(), compileModuleImpl(), clang::GeneratePCHAction::ComputeASTConsumerArguments(), computeKeyFunction(), clang::DependencyFileGenerator::CreateAndAttachToPreprocessor(), clang::CodeGenAction::CreateASTConsumer(), clang::GenerateModuleAction::CreateASTConsumer(), clang::TestModuleFileExtension::createExtensionReader(), clang::CompilerInvocation::CreateFromArgs(), clang::CreateFrontendBaseAction(), clang::CodeGen::createOffloadEntriesAndInfoMetadata(), clang::CompilerInstance::createOutputFile(), clang::TargetInfo::CreateTargetInfo(), clang::createVFSFromCompilerInvocation(), Diag(), clang::driver::Driver::Diag(), clang::Parser::Diag(), clang::Sema::Diag(), clang::Preprocessor::Diag(), clang::StructuralEquivalenceContext::Diag1(), clang::StructuralEquivalenceContext::Diag2(), diagnoseFrameworkInclude(), clang::ModuleMap::diagnoseHeaderInclusion(), emitAArch64DeclareSimdFunction(), clang::cross_tu::CrossTranslationUnitContext::emitCrossTUDiagnostics(), clang::PartialDiagnostic::EmitToString(), EmitUnknownDiagWarning(), EnableCodeCompletion(), clang::CodeGen::CodeGenModule::Error(), clang::CodeGen::CodeGenModule::ErrorUnsupported(), clang::CodeGenAction::ExecuteAction(), clang::ExecuteCompilerInvocation(), clang::VerifyDiagnosticConsumer::MarkerTracker::finalize(), clang::TextDiagnosticBuffer::FlushDiagnostics(), clang::ASTImporter::FromDiag(), GenerateOptimizationRemarkRegex(), getAliasedGlobal(), clang::SrcMgr::ContentCache::getBuffer(), getCC1Arguments(), getCodeModel(), clang::FrontendAction::getCurrentModule(), getInputBufferForModule(), getLastArgIntValueImpl(), clang::ASTReader::getOriginalSourceFile(), getRelocModel(), getTargetEntryUniqueInfo(), clang::targets::ARMTargetInfo::handleTargetFeatures(), clang::targets::X86TargetInfo::handleTargetFeatures(), hasSuperInitCall(), clang::Rewriter::IncreaseIndentation(), clang::targets::PPCTargetInfo::initFeatureMap(), InitializeFileRemapping(), clang::CompilerInstance::InitializeSourceManager(), initOption(), isParenthesizedADLCallee(), clang::CodeGen::CodeGenModule::isTypeConstant(), isTypeSubstitutable(), clang::CompilerInstance::loadModule(), clang::CompilerInstance::loadModuleFromSource(), clang::CodeGen::loadOffloadInfoMetadata(), mangleAArch64VectorBase(), maybeDiagnoseIDCharCompat(), maybeDiagnoseUTF8Homoglyph(), ParseAnalyzerArgs(), parseAnalyzerConfigs(), clang::driver::Driver::ParseArgStrings(), ParseCodeGenArgs(), parseDiagnosticLevelMask(), ParseFrontendArgs(), ParseLangArgs(), ParsePreprocessorArgs(), ParseTargetArgs(), parseVisibility(), ppcUserFeaturesCheck(), prepareToBuildModule(), PrintExpected(), clang::Sema::PrintInstantiationStack(), clang::Sema::PrintPragmaAttributeInstantiationPoint(), PrintUnexpected(), clang::ProcessWarningOptions(), clang::arcmt::FileRemapper::remap(), clang::arcmt::TransformActions::report(), reportDiag(), clang::arcmt::CapturedDiagList::reportDiagnostics(), clang::CodeGen::InstrProfStats::reportDiagnostics(), clang::ento::CheckerManager::reportInvalidCheckerOptionValue(), rewriteToNumericBoxedExpression(), runThinLTOBackend(), setCommandLineOpts(), SetDelayedDiagnostic(), SetUpDiagnosticLog(), clang::StringLiteralParser::StringLiteralParser(), clang::ASTImporter::ToDiag(), clang::VerifyDiagnosticConsumer::UpdateParsedFileStatus(), clang::ento::CheckerRegistry::validateCheckerOptions(), clang::targets::MipsTargetInfo::validateTarget(), and Write_RethrowObject(). Definition at line 1306 of file Diagnostic.h. Definition at line 472 of file Diagnostic.cpp. References clang::StoredDiagnostic::fixit_begin(), clang::StoredDiagnostic::fixit_end(), clang::StoredDiagnostic::getID(), clang::StoredDiagnostic::getLevel(), clang::StoredDiagnostic::getLocation(), clang::StoredDiagnostic::getMessage(), clang::DiagnosticConsumer::HandleDiagnostic(), clang::DiagnosticConsumer::IncludeInDiagnosticCounts(), max(), clang::StoredDiagnostic::range_begin(), clang::StoredDiagnostic::range_end(), and Warning. Reset the state of the diagnostic object to its initial configuration. Definition at line 121 of file Diagnostic.cpp. Referenced by clang::FixItRecompile::BeginInvocation(), clang::PrecompiledPreamble::Build(), DiagnosticsEngine(), clang::ASTUnit::LoadFromCompilerInvocationAction(), makeStandaloneDiagnostic(), and clang::ASTUnit::Reparse(). Definition at line 793 of file Diagnostic.h. Set the diagnostic client associated with this diagnostic object. ShouldOwnClient true if the diagnostic object should take ownership of client. Definition at line 99 of file Diagnostic.cpp. Referenced by DiagnosticsEngine(), clang::FixItRewriter::FixItRewriter(), SetUpDiagnosticLog(), SetupSerializedDiagnostics(), clang::VerifyDiagnosticConsumer::UpdateParsedFileStatus(), ~DiagnosticsEngine(), and clang::FixItRewriter::~FixItRewriter(). Specify the maximum number of constexpr evaluation notes to emit along with a given diagnostic. Definition at line 574 of file Diagnostic.h. If a diagnostic is already in-flight but the front end must report a problem (e.g., with an inconsistent file system state), this routine sets a "delayed" diagnostic that will be emitted after the current diagnostic completes. This should only be used for fatal errors detected at inconvenient times. If emitting a delayed diagnostic causes a second delayed diagnostic to be introduced, that second delayed diagnostic will be ignored. DiagID The ID of the diagnostic being delayed. Arg1 A string argument that will be provided to the diagnostic. A copy of this string will be stored in the DiagnosticsEngine object itself. Arg2 A string argument that will be provided to the diagnostic. A copy of this string will be stored in the DiagnosticsEngine object itself. Definition at line 147 of file Diagnostic.cpp. References dump(), clang::diag::Error, clang::diag::Fatal, clang::SourceManager::getBuffer(), clang::SourceManager::getDecomposedIncludedLoc(), clang::SourceManager::getDecomposedLoc(), clang::FileID::getHashValue(), clang::SourceManager::getLocForStartOfFile(), clang::SourceLocation::getLocWithOffset(), clang::DiagnosticIDs::getWarningOptionForDiag(), clang::diag::Ignored, clang::FileID::isValid(), clang::SourceLocation::isValid(), clang::Last, Offset, P, clang::SourceLocation::print(), clang::diag::Remark, Report(), State, and clang::diag::Warning. Referenced by clang::SrcMgr::ContentCache::getBuffer(), and clang::DiagnosticIDs::getNearestOption(). Set the error-as-fatal flag for the given diagnostic group. This function always only operates on the current diagnostic state. Definition at line 429 of file Diagnostic.cpp. References Diag(), clang::diag::Error, clang::diag::Fatal, clang::DiagnosticMapping::getSeverity(), clang::DiagnosticMapping::setNoErrorAsFatal(), clang::DiagnosticMapping::setSeverity(), setSeverityForGroup(), and clang::diag::WarningOrError. Set the warning-as-error flag for the given diagnostic group. Definition at line 398 of file Diagnostic.cpp. References Diag(), clang::diag::Error, clang::diag::Fatal, clang::DiagnosticMapping::getSeverity(), clang::DiagnosticMapping::setNoWarningAsError(), clang::DiagnosticMapping::setSeverity(), setSeverityForGroup(), clang::diag::Warning, and clang::diag::WarningOrError. Set type eliding, to skip outputting same types occurring in template types. Definition at line 641 of file Diagnostic.h. When set to true, any unmapped ignored warnings are no longer ignored. If this and IgnoreAllWarnings are both set, then that one wins. Definition at line 598 of file Diagnostic.h. Specify a limit for the number of errors we should emit before giving up. Definition at line 558 of file Diagnostic.h. When set to true, any error reported is made a fatal error. Definition at line 614 of file Diagnostic.h. Controls whether otherwise-unmapped extension diagnostics are mapped onto ignore/warning/error. This corresponds to the GCC -pedantic and -pedantic-errors option. Definition at line 686 of file Diagnostic.h. When set to true, any fatal error reported is made an error. This setting takes precedence over the setErrorsAsFatal setting above. Definition at line 620 of file Diagnostic.h. If this and WarningsAsErrors are both set, then this one wins. Definition at line 587 of file Diagnostic.h. Referenced by clang::arcmt::CheckAction::BeginInvocation(), clang::arcmt::MigrateSourceAction::BeginInvocation(), clang::arcmt::MigrateAction::BeginInvocation(), clang::arcmt::ObjCMigrateAction::BeginInvocation(), and clang::ProcessWarningOptions(). Pretend that the last diagnostic issued was ignored, so any subsequent notes will be suppressed, or restore a prior ignoring state after ignoring some diagnostics and their notes, possibly in the middle of another diagnostic. This can be used by clients who suppress diagnostics themselves. Definition at line 669 of file Diagnostic.h. References clang::DiagnosticIDs::Fatal, clang::DiagnosticIDs::Ignored, and clang::DiagnosticIDs::Warning. Referenced by clang::Sema::EmitCurrentDiagnostic(), clang::arcmt::CapturedDiagList::hasErrors(), and clang::Sema::SFINAETrap::~SFINAETrap(). Definition at line 764 of file Diagnostic.h. Referenced by makeStandaloneDiagnostic(), and clang::ASTUnit::Reparse(). Set tree printing, to outputting the template difference in a tree format. Definition at line 646 of file Diagnostic.h. This allows the client to specify that certain warnings are ignored. Notes can never be mapped, errors can only be mapped to fatal, and WARNINGs and EXTENSIONs can be mapped arbitrarily. Loc The source location that this change of diagnostic state should take affect. It can be null if we are setting the latest state. Definition at line 342 of file Diagnostic.cpp. References clang::diag::DIAG_UPPER_LIMIT, clang::diag::Error, clang::diag::Fatal, clang::DiagnosticMapping::getSeverity(), clang::SourceLocation::isInvalid(), clang::DiagnosticMapping::setUpgradedFromWarning(), and clang::diag::Warning. Referenced by ParseAlignPragma(), setSeverityForAll(), and setSeverityForGroup(). Add the specified mapping to all diagnostics of the specified flavor. Mainly to be used by -Wno-everything to disable all warnings but allow subsequent -W options to enable specific warnings. Definition at line 459 of file Diagnostic.cpp. References Diag(), clang::DiagnosticIDs::getAllDiagnostics(), and setSeverity(). Referenced by clang::Preprocessor::LexOnOffSwitch(), and clang::ProcessWarningOptions(). Change an entire diagnostic group (e.g. "unknown-pragmas") to have the specified mapping. true (and ignores the request) if "Group" was unknown, false otherwise. Flavor The flavor of group to affect. -Rfoo does not affect the state of the -Wfoo group and vice versa. Loc The source location that this change of diagnostic state should take affect. It can be null if we are setting the state from command-line. Definition at line 383 of file Diagnostic.cpp. Referenced by clang::Preprocessor::LexOnOffSwitch(), clang::ProcessWarningOptions(), setDiagnosticGroupErrorAsFatal(), and setDiagnosticGroupWarningAsError(). Set color printing, so the type diffing will inject color markers into the output. Definition at line 651 of file Diagnostic.h. Specify which overload candidates to show when overload resolution fails. By default, we show all candidates. Definition at line 658 of file Diagnostic.h. Definition at line 526 of file Diagnostic.h. Suppress all diagnostics, to silence the front end when we know that we don't want any more diagnostics to be passed along to the client. Definition at line 634 of file Diagnostic.h. When set to true mask warnings that come from system headers. Definition at line 624 of file Diagnostic.h. Specify the maximum number of template instantiation notes to emit along with a given diagnostic. Definition at line 562 of file Diagnostic.h. When set to true, any warnings reported are issued as errors. Definition at line 606 of file Diagnostic.h. Referenced by clang::ento::CreateAnalysisConsumer(), and clang::ProcessWarningOptions(). Return the current diagnostic client along with ownership of that client. Definition at line 517 of file Diagnostic.h. Referenced by clang::FixItRewriter::FixItRewriter(), SetUpDiagnosticLog(), SetupSerializedDiagnostics(), and clang::VerifyDiagnosticConsumer::UpdateParsedFileStatus(). Definition at line 976 of file Diagnostic.h. Definition at line 977 of file Diagnostic.h. Definition at line 894 of file Diagnostic.h. Definition at line 895 of file Diagnostic.h. Definition at line 896 of file Diagnostic.h. Definition at line 897 of file Diagnostic.h. Definition at line 898 of file Diagnostic.h. Definition at line 983 of file Diagnostic.h.